Technology is always expanding. One of the major expansions in technology is the ability to reach new places it hasn’t been able to reach previously. With mobile technology, this expansion can span across state lines and across countries. This helps those who make their living traveling long distances to keep in touch with those at home, find their way in unfamiliar territory, and even find the amenities they seek when they need them. If you find your job taking you over the road, consider these apps to help make your travel more comfortable. If your job takes you onto the highways, you could use an easy way to track the miles you travel for billing later. With this app you just need to add your odometer reading, press start, and press stop when you are done. It will log the travel time and mileage of your trip so you can keep better records and bill your company accordingly. If you are self-employed, you can track your mileage for your tax write offs later on. This app is great for those who prepare for the worst. If you are on the road and get lost, have an accident, or even blow a tire, this app will track your phone so those at home always know where you are. If you are stranded on the side of the road in the middle of nowhere, it can be hard to call for help and tell them exactly where you are. However, with this app you can contact those at home and get your GPS coordinates for emergency response to find you. This can help keep an accident from turning into a disaster. Lately, companies and law enforcement have been cracking down on distance drivers suffering from fatigue. Many are finding that driving while tired can turn into an expensive ticket or even termination of employment. If you are on the road and start to feel tired, this app can help you find a place to sleep for the night. The app will find hotels near you and map out the distance and directions via Google Maps. No matter where you are there is a hotel nearby. Sometimes you need to just get out and stretch your legs. If you plan to stop driving for a while, why not stop at a sight to see. AroundMe is an app that uses GPS to note your location and give you a list of sights to see near you. It will also give you a list of banks, coffee shops, cafes, and restaurants. This is a great app for taking a break no matter where you are at the time. Anyone who spends a majority of their time has already heard the GasBuddy name. 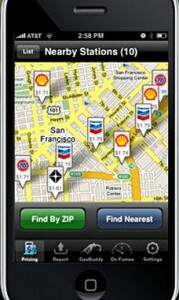 This app version of the popular site will show you where the cheapest gas prices are no matter where you are traveling. The app automatically updates as users send in their gas price findings. You can even send in your findings if you find a lower price in the area you are in. Whether you sell appliances, review hotels, or drive a truck across country, there is an app for that. 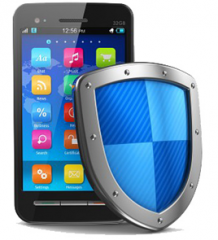 Take advantage of the new mobile technology and make your traveling easier and more interesting. Patrick Johnson is an over the road writer who understands how important trucking insurance is to those with cdl jobs. 4 of the Best Smartphone Apps for Mananging Your Finances – All Free! How do you Check a Vehicle’s History Before Buying?